Preheat oven according to box. The first thing you need to do is put your cake box mix into a bowl and replace the water with milk, replace oil with butter (double amount optional), add eggs plus 1 extra, and finally a tsp of vanilla. Next take a mixer and mix until batter is smooth. Making sure there are no clumps. If you do not have a mixer, use those muscles and do your best at stirring with spoon until smooth. Once mixed, batter is ready for pans. If you did get the Wilton Cake set, I like to add a little nonstick spray or some flour on the bottom even though I believe they are already nonstick. Add a spoonful or two try not to overfill. Because we add so much extra stuff the cake batter ends up filling 6-7 pans. Usually when I make them I only like to use 3 or 4 layers because by 5 I think it is too tall. It is your preference what size you would like it. Usually I'll make 2 layered cakes or 1 and then make cupcakes with the rest. For this blog I made 2 cakes and styled them differently just to show there are so many different and easy ways to make a bakery style cake. Bake for about 15 minutes, keeping an eye on it. If using another pan like 8 or 9 in round, follow directions on box. Once finished baking, let it cool for about 10 minutes in pan then transfer to a cooling rack. I like to put it upside down on the cooling rack to try and flatten it back down. While the cake is cooking and cooling, you can start making the icing. Beat butter and powered sugar until mixed well. Then add heavy cream and vanilla. Beat until fully mixed and smooth. Add more cream if to thick. When icing a cake you don't need some fancy icing knife. I just use a butter knife and flat spatula. Add icing to top of cooled cake spread evenly and add layer. Repeat until you placed the amount of layers you want. Then start icing the sides and trying to make it as smooth as possible. Once done icing I have two ways (actually three ways) to present this cake. The third way would be you can leave it as. 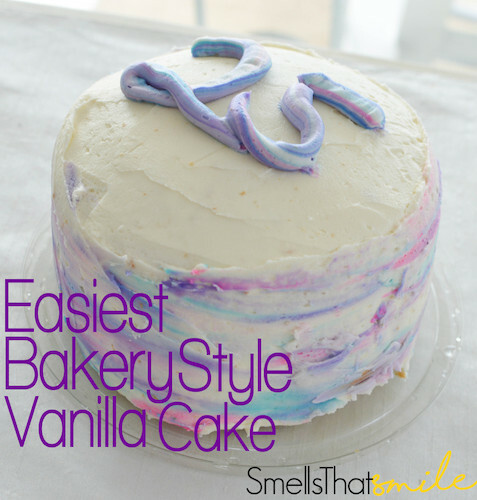 Just a perfectly simple vanilla cake! Another way to style it is just as simple as it being plain, I had some gold sprinkles and put a few on top giving it a flashy but delicate look. My final way of showing you how to decorate a cake to make it look like its from a bakery is more advanced then adding sprinkles, but still simple enough anyone can do it. This technique makes it look like it was water color painted and is an easy wait to give a cake a fun pop of color. The first is to pick a few colors or even just one color if you want of food coloring. Take a scoop of icing and create the colors you want. Next take a butter and put dots all over the cake. Next take your butter knife and smear the dots. I scrapped some of the excess icing on the bowl to save for later. Keep smearing until it is blended to your preference. Add more icing if there is not enough color. I wanted to add a number since it was a birthday cake. Adding big numbers is a simpler yet still looks nice way instead of writing out "happy birthday". If you aren't celebrating it looks nice plain as well. So I took the extra icing and put it in a ziploc bag. If you have a piping bag you can use it, I just wanted to show you don't need one. Cut the tip of the piping bag then write the number. That's it! A simple way to make an awesome looking cake! Preheat Oven according to box. Add cake mix into bowl add milk, melted butter, eggs, and vanilla. Mix until smooth. If using Wilton cake pans, I like to add flour or non-stick spray in pan. Add a spoonful or two of batter to pans. Bake for about 15 minutes. If you are not, follow pan directions cake box. Once finished baking, let cool for about ten minutes in pan then put on a cooling rack. I like to put it upside down on cooling rack because it will start to flatten the top. While cake is cooking and cooling, start making the icing. Add 3 cups of powdered sugar and softened butter in bowl. Beat until well mixed then add cream and vanilla. Mix until smooth. Once cake is cooled, icing and layer cake. Evenly spreading it until as smooth as possible.